Christopher Smith has taken an obvious love of film noir and managed to craft one of the most impressive neo-noirs since Rian Johnson's 2005 film BRICK. Harper (Tye Sheridan), an arrogant but socially clueless law student, has become convinced that his stepfather (Stephen Moyer) is responsible for the accident that has left his mother hospitalized and comatose. We meet Harper (whose name is a nod to the 1966 Paul Newman film) drinking whiskey in a bar that's probably not the regular watering hole for most aspiring young attorneys. As if by accident, he finds himself in a conversation/conflict with Johnny (Emory Cohen) and his girlfriend, Cherry (Bel Powley). When the morning comes, Harper is faced with two choices, on one path he chooses to kill and on the other chooses to face his suspicions directly. Using a split narrative structure, Smith allows the viewer to witness our protagonist following two very different paths simultaneously. Sheridan brings an arrogance that is unique to a young man of privilege when performing as Harper. He also manages to balance that arrogance with enough wide-eyed innocence to make the character tolerable. It's a difficult and subtle balance to strike, but he executes it perfectly. Choen chews up most the scenery as Johnny Ray, but if you pay attention he's giving a far more layered and telling performance than is immediately apparent. He makes choices that can feel jarring but actually go a long way to informing his character. While the costume department may have drawn inspiration from Patricia Arquette's Alabama in TRUE ROMANCE, Powley's performance as Cherry is far more downtrodden and defeated. One of the reasons filmmakers go back to noir time and time again is in the mood of pessimism, fatalism, and menace that defines the genre. Style and atmosphere are welcome in these thrillers and any director worth his/her salt probably assumes they have a good one up their sleeve. Reconstruction and modernization of the noir's nothing new. BLUE VELVET, LA CONFIDENTIAL, THE LONG GOODBYE, and countless others have made impressive contributions to the sub-genre. Smith shows a great deal of competence and confidence in his voice to have attempted a story like DETOUR. The film asks the audience to wait patiently for its characters to reveal themselves over 90 minutes and rewards us in doing so. The story and its many twists and turns are incredibly simple. If you try to get ahead of the film you probably can, but the reward here is in the details. This film isn't about where it's headed, this film is about how it gets there. The journey is paramount and the true cinematic pleasure comes in giving yourself over the filmmaker. Although Detour is set on the road from Los Angeles to Las Vegas the film was shot in South Africa.This is a film made by an Englishman, in Africa, about Americans and the combination of these elements is perfect. Everything about this film feels slightly off. From the non-traditional structure to the location, as an audience, we are shown the familiar in a way that feels new and uncomfortable. It's the film equivalent of picking up what you think is a glass of iced tea only to discover its milk. Exquisitely unnerving. Christopher Ross has been one of those cinematographers to watch for the last couple years. His work on BLACK SEA and EDEN LAKE could not be more different but equally as effective. He has the ability to shoot confined spaces with a sense scale and creates intimacy against large landscapes. 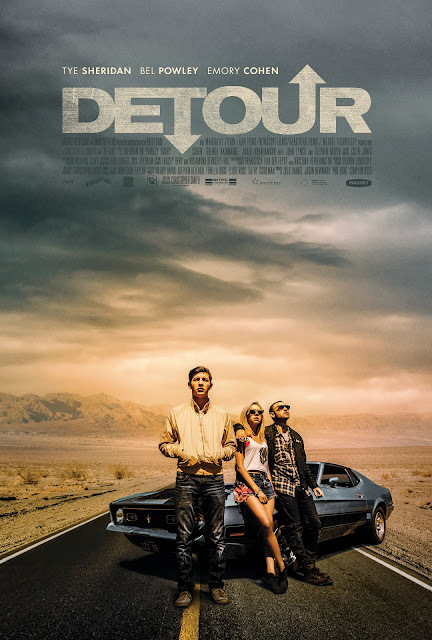 DETOUR is composed of impressive shots that help define the ill at ease nature of the film. The technical aspects of the film elevate what could have easily been a forgettable direct to cable thriller to a pretty solid little film that I can't recommend highly enough. DETOUR is a welcome surprise. I'm looking forward to whatever Smith does next.